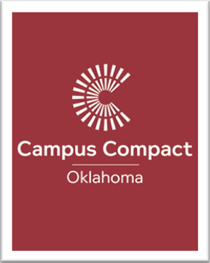 Oklahoma Campus Compact (OkCC) is an organization of Oklahoma colleges and university presidents who strive to advance the public purposes of higher education. Established in 2000, OkCC currently represents 37 public and private institutions of higher education in the state. OkCC provides leadership, networking and professional development, and technical assistance to campuses and communities in academic service-learning and community-based learning, civic engagement, and community service. OkCC joins Campus Compact’s national office and 35 state and network offices throughout the United States in working to strengthen the capacity of our member colleges and universities to prepare students for a life of engaged citizenship through involvement in community service and learning. Founded in 1985 by the presidents of Brown, Georgetown and Stanford universities and the president of the Education Commission of the States, Campus Compact is now a coalition of nearly 1,200 colleges and universities committed to the public purposes of higher education. We are a network comprising a national office in Boston, Massachusetts, as well as 35 state and regional-based Campus Compacts. Campus Compact was created to help colleges and universities create support structures that include offices and staff to coordinate community engagement efforts, training to help faculty members integrate community work into their teaching and research, scholarships and other student incentives, and the institutional will to make civic and community engagement a priority. As the only national higher education association dedicated solely to campus-based civic engagement, Campus Compact enables campuses to develop students’ citizenship skills and forge effective community partnerships. Our resources support faculty and staff as they pursue community-based teaching and scholarship in the service of positive change. Today more than 98 percent of Campus Compact member campuses have one or more community partnerships, and more than 90 percent include service or civic engagement in their mission statements. These campuses are putting their knowledge and resources to work to help build strong communities and educate the next generation of responsible citizens. Read about the national Campus Compact structure and governance at www.compact.org. Oklahoma Campus Compact (OkCC) supports the civic purpose of higher education that includes developing students as citizens. OkCC will assist member institutions in their efforts to develop citizenship skills by promoting and advancing methodologies including service-learning, volunteerism, community service and political engagement. Because we are an organization of educational institutions, Campus Compact puts special emphasis on partnerships to support student success and civic learning across the education continuum. We help colleges and universities advance community goals in areas such as K-12 learning, college readiness, college access, and the development of student civic knowledge and skills at every level. Campus Compact’s work strengthens colleges and universities as contributors to educational improvement now while developing the next generation of citizens and leaders for our communities. As a presidents organization, Campus Compact’s reach extends across campus, allowing a coordinated approach to building community programs. Maintains the leading online collection of resources for community-based teaching and scholarship. Provides professional development to administrators and faculty to enable them to build effective partnerships. Facilitates national partnerships connecting campuses with key issues in their local communities. Builds pilot programs to test and refine promising models in engaged teaching and scholarship. Convenes higher education institutions and organizations, along with partners beyond higher education, to share knowledge and develop collective capacity.